Jordanian police say they have restored order in the southern city of Maan, 210km (130 miles) south of Amman, after two days of anti-government riots. The violence was sparked by the murder of two men in a dispute between rival Bedouin tribes. Some 500 rioters set fire to government buildings and cars and smashed shop windows. They were said to be angry at the authorities' failure to arrest those behind the killings. The unrest began after the funeral of the two murdered workers on Monday. Residents said they had been chosen to work on a multi-million-dollar water project in the area, and accused a rival tribe of killing them. Police used tear gas against the rioters, but order was only restored early on Wednesday after the government reached an agreement with the tribal authorities. 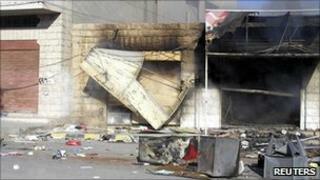 Jordanian Interior Minister Saad Hayel Srour said officials would punish those responsible for the violence. Maan is an impoverished tribal stronghold known for its defiance of central authority, correspondents say. It has been the scene of violent civil unrest in recent years, and Muslim fundamentalists have been active there.